One of the most important tasks when managing a vBulletin website is to manage the content on your website. You can create multiple channels/forums or sub-forums that group a number of topics together. This allows you to structure the different areas of your website properly. To manage the content of your website, we will use the administrative user on our vBulletin website as it has the full access rights that we need. 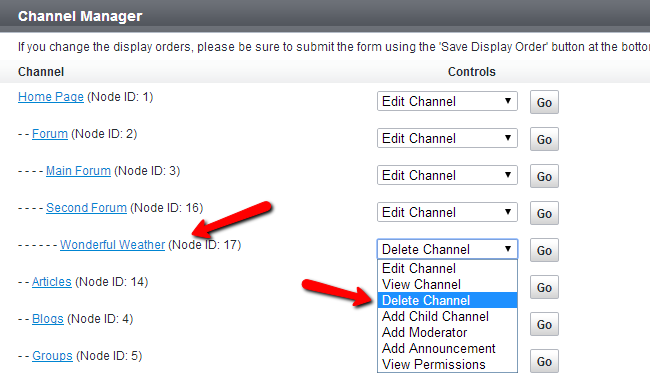 To handle the tasks that we follow in this tutorial, you need to access the AdminCP area of your vBulletin website. To add a new forum/sub-forum/channel, simply locate the Channel Management tab on the left-side menu and then Add New Forum. 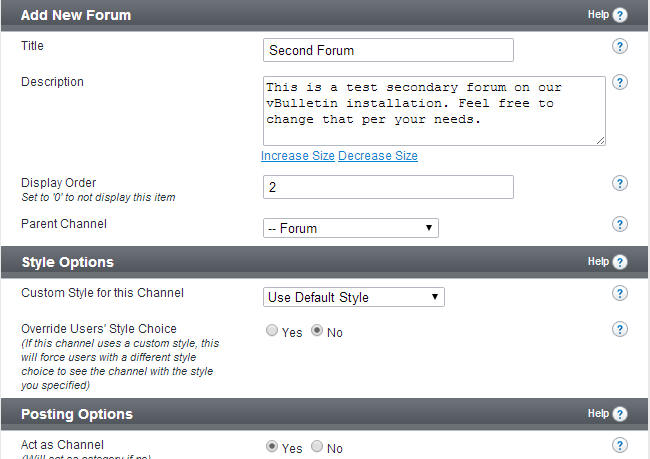 Style Option - Choose the style of the new forum, allow users to select their own, etc. Posting Options - Allow BB Codes, Smiles, etc. When you are ready with the configuration of the new forum, simply click on the Save button at the bottom-right corner of the screen to keep it. The same process goes when creating a sub-channel or a sub-forum on your vBulletin website. The only difference would be in the Parent Channel option. For example, we have created a channel/forum called Second Forum on our website. We would like to add a sub-forum to it, which will be called Wonderful Weather. To achieve that, we create a new forum and select Second Forum for a parent. To remove a forum/channel from your website, you need to navigate to the Channel Management tab on the left-side menu and then Channel Manager. You will be presented with a list of all channels/forums or sub-forums on your website. Next to each one of them, you will notice a drop-down box within the Controls tab. Select the drop-down box, next to the channel that you wish to remove and then Delete Channel. A new message will be displayed on the screen, asking for a confirmation about the deletion of the channel. If you are sure, simply click on Yes.